This entry was posted in FAQs, Heating on April 2, 2019 by The Original Flame Author. Planning to buy a Jotul stove fireplace? Then you must have done some research and chosen Jotul due to their great reviews and customer satisfaction guarantee. Being a renowned manufacturer and supplier of stoves, the company knows that choosing the perfect stove can be baffling! There are so many factors to consider so that the stove satisfies your needs. Then there is the installation procedure. You will have to not only ensure that your stove is installed properly but also check that it complies to all the necessary safety standards. 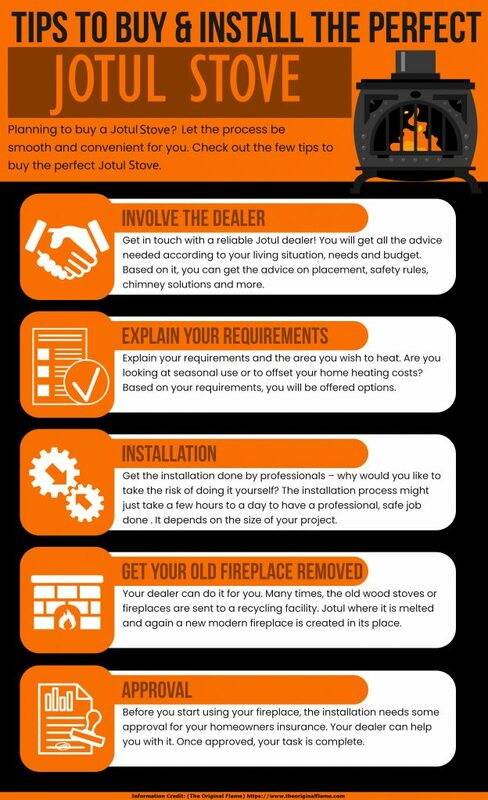 This is why Jotul has a wide network of reliable dealers who can guide you through the entire process of buying and installing a stove. To further help you out, here are a few tips that will help you easily buy and install a stove. Contact a Dealer Early On – You should get in touch with a Jotul fireplace dealer right at the beginning of the process. The dealer will provide you with advice you on what stove will be suitable for you, based on your budget and living scenario. They will also be able to shed light on important areas of concern like the placement of the stove and chimney, installation procedure, safety standards etc. Discuss your Requirements – When you have established the basics, sit down with the dealer and discuss your exact requirements. Tell the dealer about the areas of the home you are looking to heat. Also, the usage of the stove you had in mind and other similar requirements. Based on this, the dealer will be able to give you an insight into the heating cost. And also list some options that will offer the best functionality, in a cost-effective way. Installation of the Chimney and the stove – The installation of the stove and the chimney is the most important. This is because the safety of your family and your home depends on it. It is always a good option to have certified professionals do the installation. Thus, it will be in accordance with the safety standards so that the fireplace functions seamlessly. Depending on the size of the project, the installation might take a few hours or an entire day. Remove the Old Stove – If you had a stove before, or the dealer can remove it for an additional charge. Also, removing a stove means that the old chimney must also be inspected. This is to make sure it is to code and in good shape. Thus, it is best that the experienced and certified dealers do it safely. Approval and Insurance – The local authorities will want to approve the stove and chimney installation before you can begin using it. For this, the dealers will send you a report and you will forward this to your insurance company. Thus, it can be safely said that engaging a trustworthy Jotul fireplace dealer will make the process smoother and easier, helping you find the perfect stove for your home.